Are there common humanistic values? If so, have they been defined? Do you have an up-to-date handout on the AVI world-views? How are the four skills categories associated with values? How are values linked to energy management? How do I run a Future Search/Creation Conference? I cannot help wondering why the majority of values fall in three main clusters: Organizational, Self- Actualization & Emergent Order. Is this because this is where the majority of people are living their lives? In my Organisation , we have chosen the following Values: namely, Integrity, Passion, Quality, Respect and Responsibility. I do not see a ready match of my Priority Values with these.What should I do? Is it reasonable to correlate the ‘progression’ of world views from Self-Preservation through Security, Belonging, Organisation, etc to a perceived increase in personal control and personal influence? What are Energy Field Maps [EFM] / Cultural Field Maps [CFM]? What are Morals? What is morality? 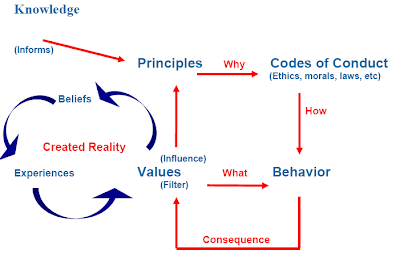 What comes first - behaviours or values? What is the basis of arriving at Priority Values? What is the link between values and skills?